Abstract. Permafrost deposits in the Beringian Yedoma region store large amounts of organic carbon (OC). Walter Anthony et al. (2014) describe a previously unrecognized pool of 159PgOC accumulated in Holocene thermokarst sediments deposited in Yedoma region alases (thermokarst depressions). They claim that these alas sediments increase the previously recognized circumpolar permafrost peat OC pool by 50%. It is stated that previous integrated studies of the permafrost OC pool have failed to account for these deposits because the Northern Circumpolar Soil Carbon Database (NCSCD) is biased towards non-alas field sites and that the soil maps used in the NCSCD underestimate coverage of organic permafrost soils. Here we evaluate these statements against a brief literature review, existing data sets on Yedoma region soil OC storage and independent field-based and geospatial data sets of peat soil distribution in the Siberian Yedoma region. Our findings are summarized in three main points. 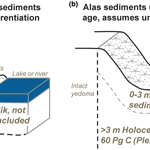 Firstly, the sediments described by Walter Anthony et al. (2014) are primarily mineral lake sediments and do not match widely used international scientific definitions of peat or organic soils. They can therefore not be considered an addition to the circumpolar peat carbon pool. We also emphasize that a clear distinction between mineral and organic soil types is important since they show very different vulnerability trajectories under climate change. Secondly, independent field data and geospatial analyses show that the Siberian Yedoma region is dominated by mineral soils, not peatlands. Thus, there is no evidence to suggest any systematic bias in the NCSCD field data or maps. Thirdly, there is spatial overlap between these Holocene thermokarst sediments and previous estimates of permafrost soil and sediment OC stocks. These carbon stocks were already accounted for by previous studies and they do not significantly increase the known circumpolar OC pool. We suggest that these inaccurate statements made in Walter Anthony et al. (2014) mainly resulted from misunderstandings caused by conflicting definitions and terminologies across different geoscientific disciplines. A careful cross-disciplinary review of terminologies would help future studies to appropriately harmonize definitions between different fields. How to cite: Hugelius, G., Kuhry, P., and Tarnocai, C.: Ideas and perspectives: Holocene thermokarst sediments of the Yedoma permafrost region do not increase the northern peatland carbon pool, Biogeosciences, 13, 2003-2010, https://doi.org/10.5194/bg-13-2003-2016, 2016.